Description: Erect, caespitose perennial to 0.5 m high; culms striate, smooth and glabrous except just below the spike. Leaves with sheath becoming glabrous and smooth upwards; ligule membranous, truncate, c. 0.5 mm long; blade flat or loosely inrolled on drying, to 2 mm wide, very scabrous, lower surface striate and densely hirsute-pubescent, upper grooved, pubescent. Spike 1.5–6 cm long bearing c. 4–10 spikelets, the rachis flexuous. Spikelets 5–9-flowered, placed sideways to rachis, pale greenish to straw-coloured. 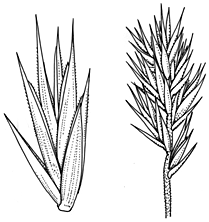 Glumes narrow-triangular, acuminate, persistent, sharply reflexed outwards to downwards at maturity, subequal, 6–7 mm long. Lemmas narrow-ovate when flattened, 8–10 mm long, with awn-like points 0.5–3 mm long. Distribution and occurrence: Grows in open forest and grassland, on heavy soils at higher altitudes.